Pinterest is testing out support for playing back GIFs on users’ pinboards, as spotted by the fashion search engine Wantering. Previously, when a user uploaded an image to Pinterest it appeared on boards as a static image, rather than in all its GIF-y glory. Now, however, some users can view the GIFs as intended directly on Pinterest, without having to click through to the original source of the image. In our own testing, GIFs displayed on site (hint: you can find them all by searching for .gif) are shown as static images when the page loads, but have a ‘Play’ symbol to start the animation. While running, the play button switches into a Pause button. It’s a small tweak, but one that would mean fewer reasons for a user to navigate away from Pinterest and support for a popular and often-shared image format, ultimately driving increased usage of the platform. We’ve asked Pinterest for official comment on the feature and whether it will be rolled out more widely and will update this article if we hear back. 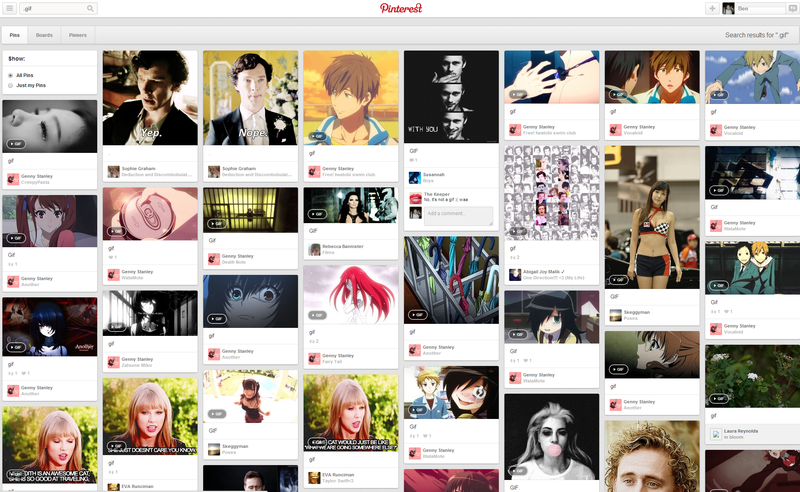 We’re always working on ways to help people discover and save the things they love, which can include animated GIFs. We’ve heard from the community that they’d like the ability to post and view GIFs as Pins, so we’re testing ways to make that happen.